I remember growing up with the car rugs, you know, the ones that had a whole city on them and you played with cars on them for hours? Well when I had kids of my own that LOVED cars, I knew I wanted something like it for them. Except I couldn't find a rug anywhere. I guess they stopped making them? But when I saw that PlaSmart had a clean quality, coated EVA foam I knew that this was the right mat for us. We got it a while ago, but I gave it to my toddler for Christmas along with a new 20 pack of cars. He was in love from the first moment we opened the mat. At first the mat had a strong smell. VERY strong smell. But I put it outside for about 4 hours and when I brought it in I could still smell it, but after placing it on the floor of my boys room, it did not smell up the actual room. If you get close to it, you can smell it. But it's not that bad anymore and doesn't smell up the room, which is important to me. It is really easy to clean and keep relatively germ free, it's also very large at 78"x46". Easily 3-4 kids could fit on it and play with it. My toddler loves driving his cars around and I know the baby will enjoy it next year as well. The mat rolls up for storage and travel. It rolls up fairly small. It's tall that way, but not very wide. Great for any age too. I also don't particularly care for the fact that the print repeats itself 3 times on the mat. I think the whole thing should be different, but my boy doesn't care or even notice haha. Price: $29.99! A great price for this mat. I love that I can just wipe it clean. Overall: **** the smell is overpowering. Otherwise a great mat. Thanks for the review on the Plasmart mat. 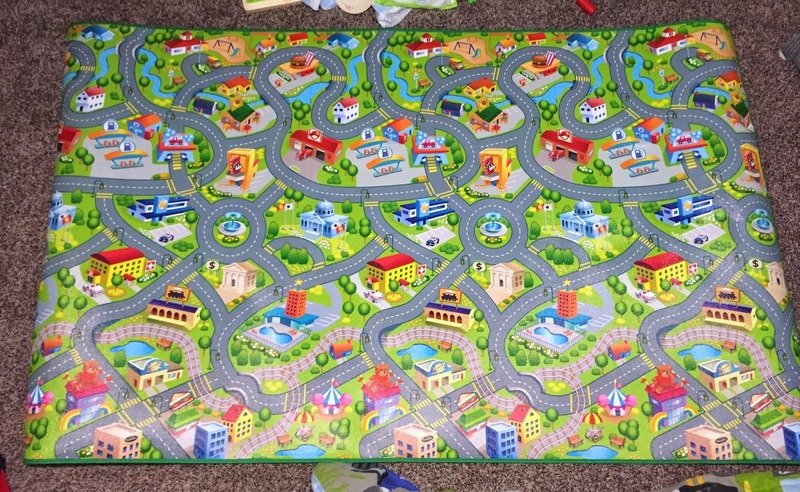 The mats I have seen are not as large, and do not have the road and car motif, which is exactly what is needed for my daughter's son. The price is reasonable too. Hello! I didn't have anything like this when I was young. It's such a fun idea. My grandson (2 years old) would love it! For $30.00 though, I'd think it wouldn't repeat. Oh well, not a big deal if they don't notice. lol Thanks for the information & review! !